This stunning women’s watch is brought to you by world renowned fashion designer Vivienne Westwood as part of their Orb collection. Elegant in its design, the Orb watch features a highly polished gold plated stainless steel bezel and 32mm round case. 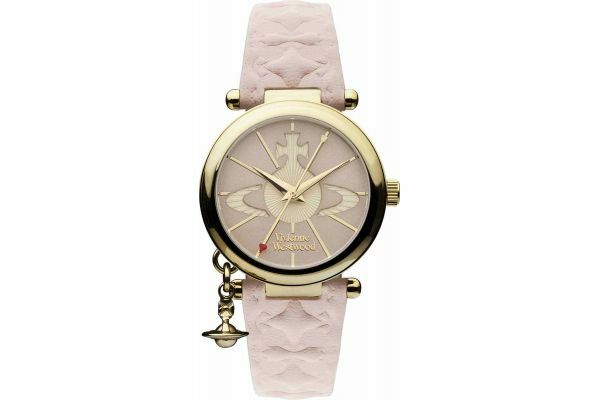 Striking with its shell pink sunray serrated dial and complete with a large Vivienne Westwood logo in a contrasting champagne colourway; the dial is beautifully emphasised by the gold batons and is adorned with a heart shape decal to the second hand. The Orb watch has been carefully crafted to ensure no opportunity for detail has gone amiss. A small golden Orb charm has been delicately attached to the watch case another detail synonymous with the Vivienne Westwood design. The sophisticated genuine leather strap is presented in a feminine embossed pink and finished with an oversized gold plated stainless-steel oval buckle closure. Powered by Swiss Quartz movement and protected by mineral glass this beautiful watch is water resistant up to 50 meters and comes complete with a 2 year guarantee. For us to size your new Vivienne Westwood Orb II watch as accurately as possible, please take a look at our downloadable Watch Sizing Guide.